AND WHAT TO SEE BY THE WAY. 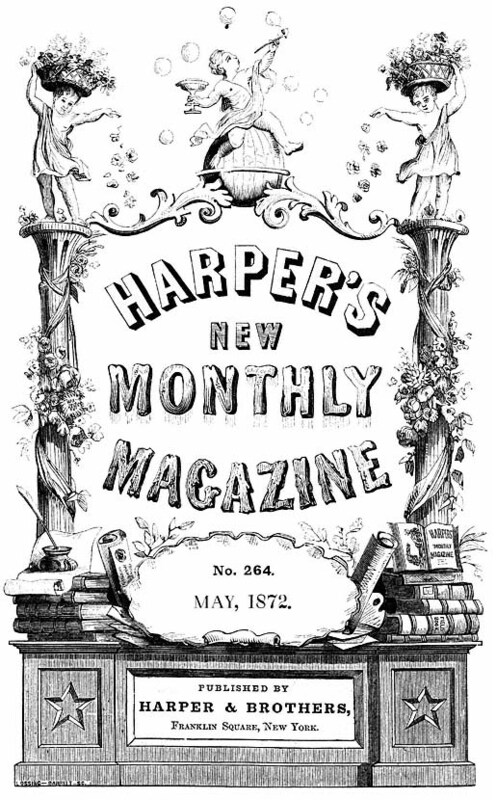 Harper's New Monthly Magazine, Vol. XLIV.—No. 264.—55. New York, Harper & Brothers, May, 1872. pp. 865-881. 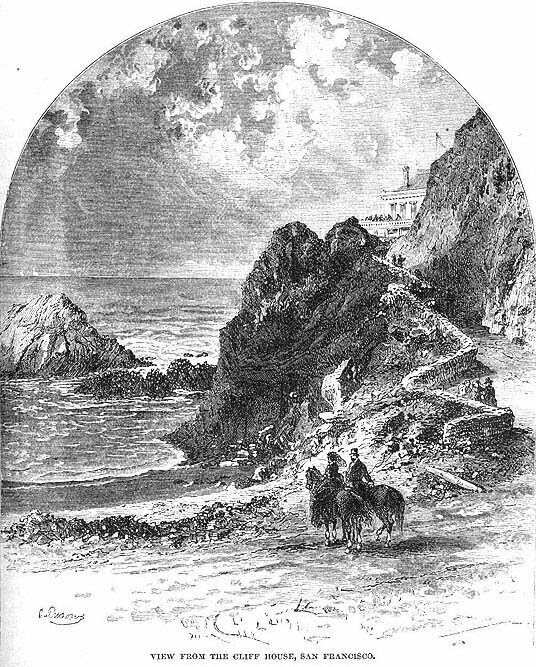 THOUGH California has been celebrated in books, newspapers, and magazines for more than twenty years, it is really almost as little known to the tourist — a creature who ought to know it thoroughly, to his own delight — as it was to Swift when he wrote, in his description of the flying island of Laputa, "The continent of which this kingdom is a part extends itself, as I have reason to believe, eastward to that unknown tract of America westward of California, and north to the Pacific Ocean, which is not above a hundred and fifty miles from Logado," and so on. California is to us Eastern people still a land of big beets and pumpkins, of rough miners, of pistols, bowle-knives, abundant fruit, green wines, high prices — full of discomforts, and abounding in dangers to the peaceful traveler. A New Yorker, inefficient except in his own business, looking to the government, municipal, State, or Federal, for almost every thing except his daily dollars; overridden by a semi-barbarous foreign population; troubled with incapable servants, private as well as public; subject to daily rudeness from car-drivers and others who ought to be civil; rolled helplessly and tediously down town to his business in a lumbering omnibus; exposed to inconveniences, to dirty streets, bad gas, beggars, loss of time through improper conveyances; to high taxes, theft, and all kinds of public wrong, year in and year out — the New Yorker fondly imagines himself to be living at the centre of civilization, and pities the unlucky friend who is "going to California." He invites him to dine before he sets out, "because you will not get a good dinner again till you return, you know." He sends him, with his parting blessing, a heavy navy revolver, and shudders at the annoyances and dangers which his friend, out of a rash and venturesome disposition, is about to undergo. Well, the New Yorker is mistaken. There are no dangers to travelers on the beaten track in California; there are no inconveniences which a child or a tenderly reared woman would not laugh at; they dine in San Francisco rather better, and with quite as much form and a more elegant and perfect service, than in New York; the San Francisco hotels are the best in the world; the noble art of cooking is better understood in California than any where else where I have eaten; the bread is far better, the variety of food is greater; the persons with whom a tourist comes in contact, and upon whom his comfort and pleasures so greatly depend, are more uniformly civil, obliging, honest, and intelligent than they are any where in this country, or, so far as I know, in Europe; the pleasure-roads in the neighborhood of San Francisco are unequaled any where; the common country roads are kept in far better order than any where in the Eastern States; and when you have spent half a dozen weeks in the State, you will perhaps return with a notion that New York is the true frontier land, and that you have nowhere in the United States seen so complete a civilization ? in all material points, at least — as you found in California. If this seems incredible to what out there they call an Eastern person, let him reflect for a moment upon the fact that New York receives a constant supply of the rudest, least civilized European populations; that of the immigrants landed at Castle Garden the neediest, the least thrifty and energetic, and the most vicious remain in New York, while the ablest and most valuable fly rapidly westward; and that, besides this, New York has necessarily a large population of native adventurers; while, on the other hand, California has a settled and permanent population of doubly picked men. "When the gold was discovered," said a Californian to whom I had expressed my wonder at the admirable quality of the State's population, "wherever an Eastern family had three or four boys, the ablest, the most energetic one, came hither. Of that great multitude of picked men, again, the weakly broke down under the strain; they died of disease or bad whisky, or they returned home. The remainder you see here, and you ought not to wonder that they an above your Eastern average intelligence, energy, and thrift. Moreover, you are to remember that, contrary to the commonly received belief, California has a more settled population than almost any State in the Union. It does not change; our people can not move west, and very few of them remove back to the East. What we have we keep, and almost all, except the Chinese, have a permanent interest in the State. Finally"' added this old miner, who is now a banker, and whom you could not tell from a New Yorker, either in his dress or the tones of his voice, or in the manner in which he transacts business, and who yet has not been "home," as he calls it, for seventeen years — "finally, you must remember that of our immigrants who came from China, not a single one, so far as is known, but knew how to read, write, and keep at least his own accounts on his own abacus when he passed the Golden Gate. We are not saints out here, but I believe we have much less of a frontier population than you in New York." And my experience persuades me that he was right. Certainly in no part of the continent is pleasure-traveling so exquisite and unalloyed a, pleasure as in California. Not only are the sights grand, wonderful, and surprising in the highest degree, but the climate is exhilarating and favorable to an active life; the weather is so certain that you need not lose a day, and may lay out your whole tour in the State without reference to rainy days, unless it is in the rainy season; the roads are surprisingly good, the country inns are clean, the beds good, the food abundant and almost always well cooked, and the charge moderate; and the journey by rail from New York to San Francisco, which costs no more than the steamer fare to London, and is shorter than a voyage across the Atlantic, is in itself delightful as well as instructive. Probably twenty Americans go to Europe for one who goes to California; yet no American who has not seen the plains, the Rocky Mountains, the Great Salt Lake, and the wonders of California can honestly, say that he has seen his own country, or that he even has an intelligent idea of its greatness. It is of this journey from New York to San Francisco that I wish to give here, such an accurate and detailed account as will, I hope, tempt many who contemplate a European, tour to turn their faces westward rather, sure that this way lies the most real pleasure. The regular route runs from Now York, by way of Philadelphia and Pittsburg, to Chicago — this is called the Pittsburg and Fort Wayne road — thence to Omaha, either by the Chicago, Burlington, and Quincy, the Chicago and Northwestern, or the Chicago and Rock Island. At Omaha you take the Union Pacific road to Ogden, and thence the Central Pacific to San Francisco. 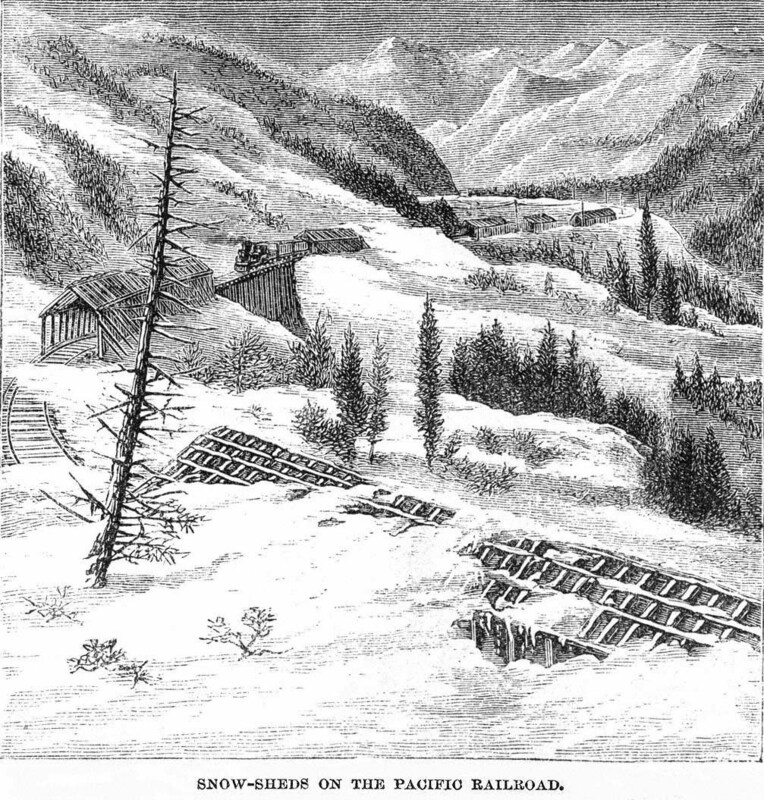 If you wish to see Colorado on your way out, you may go also from Chicago to Denver, over the Chicago, Burlington, and Missouri and the Kansas Pacific roads; and at Denver you have your choice of diversions in Colorado, with Mr. Bowles's admirable book, the "Switzerland of America," to show you the way. When you are done you pass from Denver to Cheyenne by a road which is 105 miles long, and which makes close connection with the Pacific or overland trains. 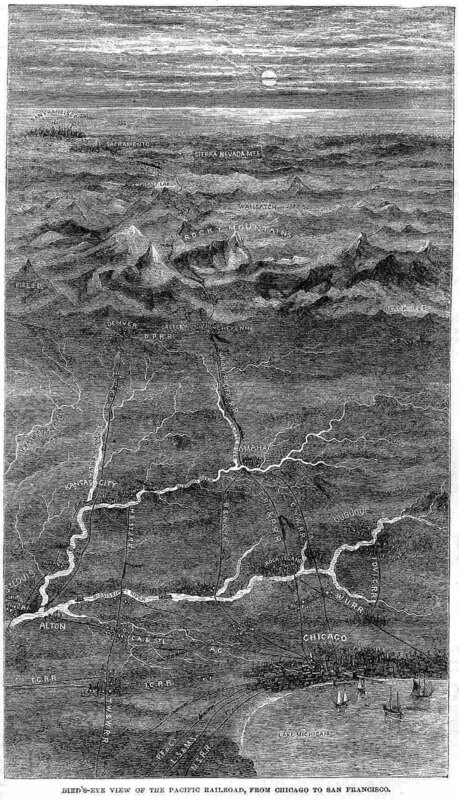 You are to understand that all these lines are connected; that, now that the great bridge at Omaha is completed, you might, if you desired it enough to charter a car, go through without change of cars; that you may buy your through-ticket in New York; and that the traveling time, from ocean to ocean, is seven days. Further on will be found tables of time, cost, and other particulars. In practice the tourist bound to California will do well to stop two days in Chicago, and one day in Salt Lake City, in which case he would get to San Francisco in ten days, and with surprisingly little fatigue, and he will have seen several very remarkable sights on the way. For instance, though Chicago itself was burned and is not yet rebuilt, the ruin is worth seeing; and near at hand, accessible by frequent trains, he may find one of the most characteristic sights of our continent, the great Chicago stock-yard ? a city whose inhabitants are cattle, sheep, and hogs, and where these creatures are so well cared for that many a poor human being supposed to have an immortal and, amenable soul, living in a New York tenement-house, is neither so cleanly lodged nor so well protected against harm or cruelty. This city of the beasts has streets, sewers, drains; it has water laid on; it is lighted with gas; it has a bank, an exchange, a telegraph-office, a post-office, an admirably kept hotel; it has even a newspaper — else it would not be an American city. It has very comfortable accommodations for 118,350 residents — namely, 21,000 head of cattle 75,000 hogs, 22,000 sheep, with stalls for 350 horses. It contains 345 acres of land; and when all this is prepared for use, 210,000 head of cattle can be lodged, fed, and cared for there at once, and with the certainty that not one will suffer or go astray. I so to speak, of the place; 1500 open pens, heavily fenced in with double plank; 100 acres are covered with pens for cattle and all these are floored with three-inch plank; 800 covered sheds for sheep and hogs; and, seventeen miles of railroad track connect this city of the beasts with every road which runs into Chicago. It has two Artesian wells, one 1032, the other 1190 feet deep, which, being spouting wells, send the water into huge tanks forty-five feet high, whence it is distributed all over the place in pipes. Fourteen fire-plugs are ready to furnish water in case of fire; immense stacks of hay and large granaries of corn contain the food needed for the beasts; and, I believe, a train of palace cattle cars now bears the emigrant animals from this their city comfortably to the Eastern butchers. Of course, as the "lower animals" do not help themselves, a considerable force of men is needed to attend upon those gathered here. The company receives and cares for all animals sent to it. It has thus taken in, penned, fed, watered, littered, and taken account of 41,000 hogs, 3000 cattle, and 2000 sheep in a single day, and that without accident, hitch, or delay. From 175 to 200 men are constantly employed in this labor; and to accommodate these and their families numerous cottages have been built, while a town-hall for public meetings and lectures, a church, a Sunday-school, and a well-kept day-school provide for their instruction and amusement. The hotel, which has bath-rooms, and is in, other respects well fitted, is for the use of the drovers and owners of cattle, whom business brings hither. At the Exchange sales we effected, and the news of a sale may be sent to Maine or Texas by a telegraph from the same room, while the money paid may be securely deposited in the bank, which is under the same roof. Thus you will see that this surprising enterprise is completely furnished in every part; and it will not be the least part of your surprise and pleasure to find that this whole business, which about New York often involves painful brutalities, is here conducted as quietly as though a Quaker presided over it, and with as much care for the feelings of the dumb brutes as though good Mr. Bergh were looking on all the time. It will cost about two millions when it is completed; is a pecuniary success, as it deserves to be; and when you hear that so long ago as 1869 Chicago received and sent off 403,102 head of cattle, 1,661,869 hogs, and 340,072 sheep, and that it will probably, remain main for years one of the greatest cattle markets in the world, you will see the need for such elaborate arrangements as I have described, and, if you are a humane person, will be pleased that these immense droves of animals are kindly cared for and comfortably lodged and fed on their way to a market. Most of the people employed in the yards are Americans. Among such a multitude of beasts as are here received Mr. Buckle's law of averages would tell you that there will be a certain few monstrosities; and you will probably be shown one or two Texas steers which look much more like elephants or mammoths than horned oxen; perhaps a two-headed sheep, or a six-legged hog; and, indeed, when I saw the stables they contained a collection which would have turned the face of a Chatham Street exhibitor green with envy. The Union Stock-yards lie but half an hour from the centre of Chicago, and there is no reason why ladies and children should not visit them if the weather is fine. I do not know of a more instructive or remarkable sight for tourists. If you want to see how private enterprise and good taste can provide for the pleasant lodging of men and women, turn from this city of the beasts and go out to Riverside Park. It always seemed to me that it would be the summit of human felicity to have a handsome house in the New York Central Park, and thus to seem to own and control, and to really enjoy as a piece of personal property, that fine pleasure-ground. When the Tammany Ring was in the height of its power this thought was also entertained by it; chiefs, who for some time nursed and fondled a proposition that "a few eminent citizens" should be allowed, "under proper restrictions," to build themselves fine houses in the Park. It is not difficult to guess who would have been the eminent citizens to share among themselves this happy privilege; and New York may thank Harper's Weekly, the Times, and Thomas Nast that their ambitious scheme has come to naught. Their names would have begun with a T and an S and a C and an H.
Well, a company of capitalists in Chicago conceived the idea that it would be possible and profitable to buy a piece of ground near that city, lay it out as tastefully and improve it as thoroughly as the New York Central Park, and then sell it off in lots to people of taste and wealth. It needed some faith to begin such an undertaking; but if you go to Riverside you will see Central Park roads, drives, and paths; you will find gas and water supplied as though it were a city; you will find tasteful public buildings, a hotel, which was a place of refuge for multitudes of Chicago people after the great fire, and which is a favorite summer resort; and you will see a good many people living already with Central Park surroundings, and with all the comforts and social advantages of the city and the country combined. Perhaps you will wonder whether co-operation is not a good thing for the wealthy as well as the struggling poor, and whether the many who prefer to live in the suburbs of great cities would not do wisely and save money if they would — having found a region they like — unite to improve it upon some general and tasteful plan. And whatever you may think of Chicago in rains, or of the future of that stirring place, when you have seen Riverside and the Union Stock - yards you will acknowledge that Chicago capitalists have known how, in the words of the old tavern signs, to provide "first - rate accommodations for man and beast." At Chicago the journey to California really begins. In the East we make journeys by rail; west of Chicago men live on the cars. In the East a railroad journey is an interruption of our lives. We submit to it, because no one has yet been ingenious enough to contrive a flying-machine, and the telegraph wires do not carry passengers by lightning; but we submit to it reluctantly, we travel by night in order to escape the tedium of the journey, and no one thinks of amusing himself on the cars. When you leave Chicago you take up your residence on the train. The cars are no longer a ferry to carry you across a short distance: you are to live in them for days and nights; and no Eastern man knows the comfort or pleasure of traveling by rail until he crosses the plains. I suspect that part of our discomfort in making a railroad journey comes from its brevity. You are unsettled; the car, on a common journey, is but a longer ferry; and who ever thought of taking his ease on a ferry-boat? You can not fix your mind on the present; your constant thought is of when you will get there. Now the journey to San Francisco takes not a few hours, but a number of days; and when you are safely embarked on the train at Chicago, you leave care behind in the dépôt, and make yourself comfortable, as one does on a sea voyage. Moreover, until you have taken this journey, you will never know how great a difference it makes to your comfort whether your train goes at the rate of forty or at twenty-two miles per hour. This last is the pace of the iron horse between Omaha and San Francisco; and it is to the fierce and rapid rush of an Eastern lightning express what a gentle and easy amble is to a rough and jolting trot. It would not be surprising to find that the overland journey will, by-and-by, create a public opinion in favor of what New Yorkers would call slow trains. Certainly a lightning express rushing through from Chicago to San Francisco would not carry any one, except an express-man, a second time. At thirty-five or forty miles per hour the country you pass through is a blur; one hardly sees between the telegraph poles; pleasure and ease are alike out of question; reading tires your eyes, writing is impossible, conversation impracticable except at the auctioneer pitch, and the motion is wearing and tiresome. But at twenty-two miles per hour travel by rail is a different affair; and having unpacked your books and unstrapped your wraps in your Pullman or Central Pacific palace car, you may pursue all the sedentary avocations and amusements of a parlor at home; and as your housekeeping is done — and admirably done — for you by alert and experienced servants; as you may lie down at full length or sit up, sleep or wake, at your choice; as your dinner is sure to be abundant, very tolerably cooked, and not hurried; as you are pretty sure to make acquaintances on the car; and as the country through which you pass is strange, and abounds in curious and interesting sights, and the air is fresh and exhilarating — you soon fall into the ways of the voyage, and if you are a tired businessman, or a wearied housekeeper, your careless ease will be such a rest as certainly most busy and overworked Americans know how to enjoy. I tell you all this in some detail, because it was new to me, and it is worth while to be spared the unpleasant forebodings of weariness and lack of occupation which troubled me when I was packing my trunk for Frisco. You write very comfortably at a table in a little room, called a drawing-room, entirely closed off, if you wish it, from the remainder of the car, which room contains two large and comfortable arm-chairs and a sofa, two broad, clean, plate-glass windows on each side, which may be doubled if the weather is cold, hooks in abundance for shawls, hats, etc., and mirrors at every corner. Books and photographs lie on the table; your wife sits at the window, sewing and looking out on long ranges of snow-clad mountains, or on boundless ocean-like plains; children play on the floor, or watch at the windows for the comical prairie-dogs sitting near their holes, and turning laughable somersaults as the car sweeps by. You converse as you would in your parlor at home; the noise of the train is as much lost to your consciousness as the steamship's rush through the waters; the air is pure, for these cars are thoroughly ventilated; the heating apparatus used seems to me quite perfect, for it keeps the feet warm, and diffuses an agreeable and equal heat through all parts of the car. This is accomplished by means of hotwater pipes fastened near the floor. As at sea, so here, the most important events of the day are your meals. The porter calls you at any hour you appoint in the morning; he gives you half an hour's notice of breakfast, dinner, or supper; and the conductor tells you not to hurry, but to eat at your ease, for he will not leave any one behind. Your beds are made up and your room or section swept and aired while you are at breakfast, or before, if you are early risers; you find both water and fresh towels abundant; ice is put into the tank, which supplies drinking-water at the most improbable places in the great wilderness; and an attentive servant is always within call, and comes to you at intervals during the day to ask if you need any thing to make you more contented. About eight o'clock — for, as at sea, you keep good hours — the porter, in a clean gray uniform, like that of a Central Park policeman, comes in to make up the beds. The two easy-chairs are turned into a double berth; the sofa undergoes a similar transformation; the table, having its legs pulled together, disappears in a corner; and two shelves being let down furnish two other berths. The freshest and whitest of linen and brightly colored blankets complete the outfit; and you undress and go to bed as you would at home, and unless you have eaten too heartily of antelope or elk, will sleep as soundly. Thus you ride onward, day after day, toward the setting sun, and unless you are an extremely unhappy traveler, your days will be filled with pleasure from the novel sights by the way. At Burlington you cross the Mississippi over a noble bridge, and will be surprised to see what a grand river the Father of Waters is nearly 1600 miles above its mouth. 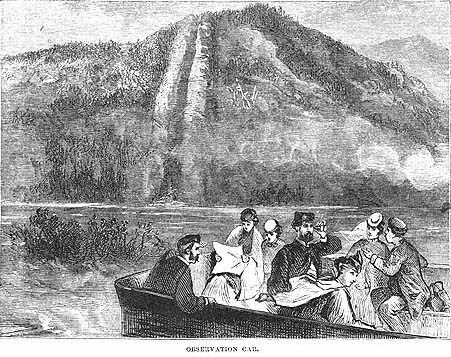 At Omaha you cross the Missouri, there a variable, turbid, but in the early spring a narrow river, which yet requires a bridge more than a mile long when the stream is bank-full. This now bridge at Omaha was built by the engineer to whom New York is indebted for the iron bridge at Harlem, T. E. Sickles, and it is a remarkable work to be done so far from the appliances of civilization. From Chicago to Omaha your train will carry a dining car, which is a great curiosity in its way. I expected to find this somewhat greasy, a little untidy, and with a smell of the kitchen. It might, we travelers thought, be a convenience, but it could not be a luxury. But in fact it is as neat, as nicely fitted, as trim and cleanly, as though Delmonico had furnished it; and though the kitchen may be in the forward end of the car, so perfect is the ventilation that there is not even the faintest odor of cooking. 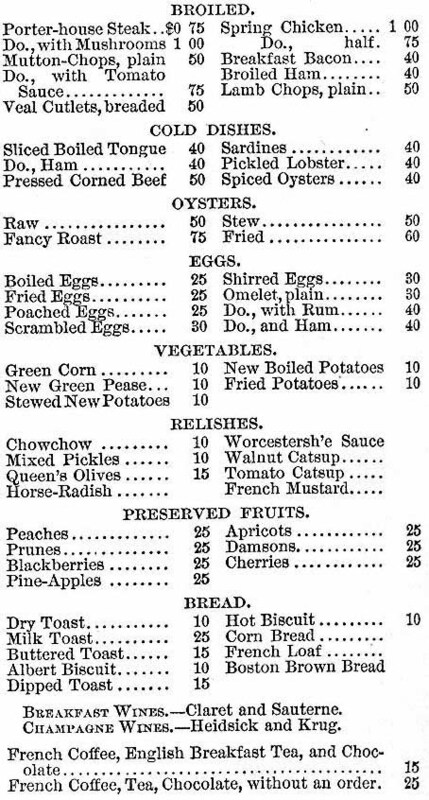 You sit at little tables which comfortably accommodate four persons; you order your breakfast, dinner, or supper from a bill of fare which, as you will see below, contains a quite surprising number of dishes, and you eat from snowwhite linen and neat dishes admirably cooked food, and pay a moderate price. Beyond Omaha, unless you have taken seats in a hotel car, you eat at stations placed at proper distances apart, where abundant provision is made, and the food is, for the most part, both well cooked and well served. These hotel stations are under the supervision and control of the managers of the roads, and at many of them, especially on the Central Pacific road — in California, that is to say — your meals are served with actual elegance. 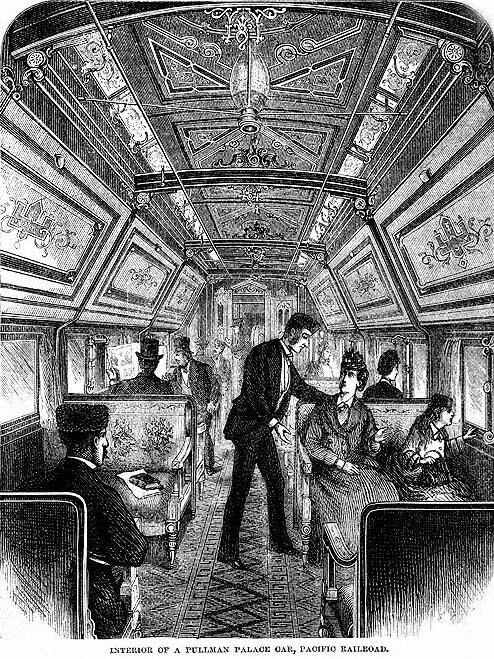 Sufficient time is allowed — from thirty to thirty-five minutes — to eat; the conductor tells you beforehand that a bell will be rang five minutes before the train starts, and we always found him obliging enough to look in and tell the ladies to take their time, as he would not leave them. There is a pleasant spice of variety and adventure in getting out by the way-side at the eating stations. We saw strange faces, we had time to look about us, the occasional Indian delighted the children, we stretched our legs, and saw something of our fellow passengers in the other cars. 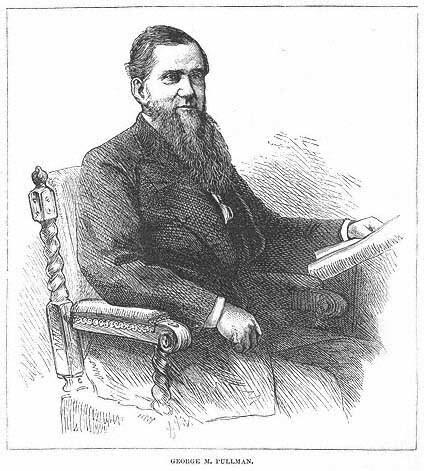 Moreover, if you have a numerous party desirous to eat together, the porter will telegraph ahead for you to have a sufficient number of seats reserved, and thus you take your places without flurry or haste, and do not have your digestion spoiled by preliminary and vexatious thoughts about pushing for a good place. In short, these trains are managed for the pleasure and accommodation of the passengers. The voyage would, I suppose, be unendurable else. The sleeping car, but for which the journey to the Pacific by rail would be extremely uncomfortable, but by whose help it is made a pleasure-trip, owes its development and perfection to Mr. George M. Pullman, who is the inventor and patentee of most of the ingenious devices by which the traveler's comfort is secured in these cars. Of course he is an American. He began life poor; was once a miner in Colorado, and was, I believe, so poor when he began the experiment of his sleeping cars that it was with great difficulty he raised the means to build his first car. He is now president of the Pullman Car Company, which has five hundred sleeping, drawing-room, and hotel cars on different railroads, and is building more, at the rate of three finished cars for every week of the present year. The company are also building a new kind of day cars, to be put on such short routes as that between New York and Washington; and by the time you are reading this it will run a daily hotel car from Chicago to Ogden, in which you may sit and sleep and have your meals served at any time you may choose to order them. It is planning, and will fit up this year near Chicago extensive car-works of its own on grounds large enough to contain also the cottages of the thousand workmen who will be there employed, and it is said that these grounds are to be planned with special regard to the convenience of the men and their families. The company has already found it expedient to keep and furnish, near the dépôts in all the great cities, rooms where conductors and porters may, at the end of a journey, bathe, change their clothes, make out their reports, and read, write, or amuse themselves. Mr. Pullman thinks that as he requires much from his men, and as they are picked men, trained with care, it is an advantage to the company to furnish them such a home at the ends of the great routes of travel, where they may make themselves comfortable and at ease. Certainly it is a humane thought, and likely, besides, to give him the command of responsible servants. The Pullman cars are constantly improving. The Russian Grand Duke traveled last winter in perhaps the most commodious and perfect manner in which any one ever traveled by rail. He had in one train a day car, in which he and his companions could sit at ease, read, write, or amuse themselves as in a parlor; a dining or hotel car, into which they walked to breakfast or dinner; and a sleeping car. No doubt the impressions he got of this kind of pleasure-traveling will facilitate Mr. Pullman's entrance into Russia, where, as well as in England, Germany, and France, the Pullman Company will within two years have placed their cars, as arrangements are now making for that purpose. The superiority of the American sleeping cars is in their cleanliness, the perfection of their heating and ventilating contrivances, and the presence of every thing which can make a car convenient to live in. There is nothing like them in Europe, and all European travelers in this country have been surprised and delighted with them. The Pullman Company is successful, as it deserves to be. It now runs cars on nearly one hundred roads, the railroad companies generally owning one-half the stock of the cars they use, and thus having a mutual interest. The Pullman Company sells to the public what the railroad company in such cases does not furnish — the sleeping-car accommodations. You may now ride in Pullman cars over sixty thousand miles of railroad. The Pullman Company already employs over two thousand persons, and in its new car-shops will employ one thousand more, and all this vast business has grown from the smallest beginnings. 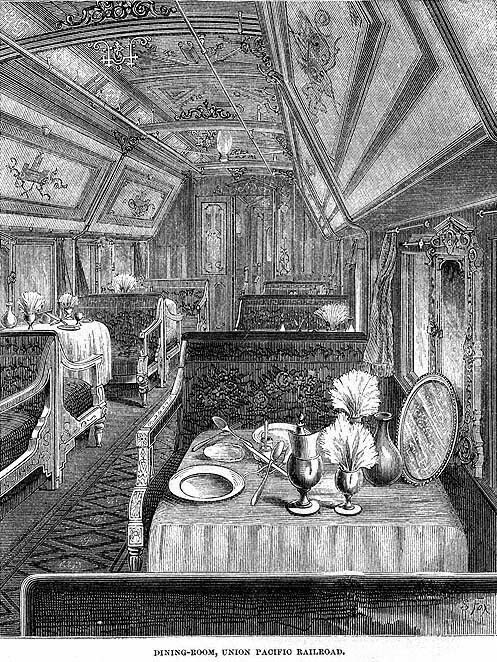 "For a regular sleeping car, containing twelve open sections of two double berths each, and two staterooms of two double berths each (in all twenty-eight berths), with conductor and porter, seventy-five dollars per day. 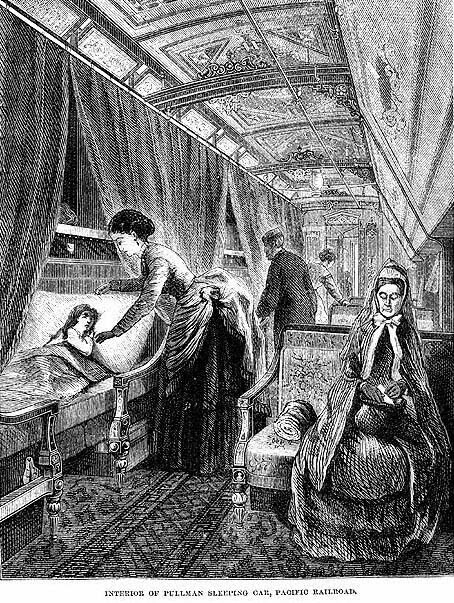 "For a drawing-room car, containing two drawing-rooms, having each a sofa and two large easy-chairs by day, and making up at night into two double and two single berths, three state-rooms having each two double berths, and six open sections of two double berths each (in all twenty-six berths), with conductor and porter, seventy-five dollars per day. "For a hotel car, containing two drawing-rooms, as above described, one state-room having two double berths, and six open sections of two double berths each (in all twenty-two berths), and having also, in one end, a kitchen fully equipped with every thing necessary for cooking and serving-meals, with conductor, cook, and two waiters, eighty-five dollars per day. "The conductor, if desired, will make all arrangements for the excursionists with the railroads for procuring transportation of the car; and in the case of their taking a hotel car, will also act as steward, purchasing for them the requisite provisions for the table. "The car is chartered, with its attendants, at a certain rate per day from the time it is taken until we receive it back again. "We have no facilities for securing special rates of railroad fare, and would suggest that, in case an excursion is organized, application be made to any ticket agent who is empowered to sell through-tickets, and the best rates of railroad fare obtained from him to and from the terminal point of the proposed trip. "We can forward a car from our head-quarters in Chicago to any point which the excursionists may designate as their starting-place." The Pullman hotel car is one of the most ingenious as well as one of the most convenient of all modern arrangements for travel. 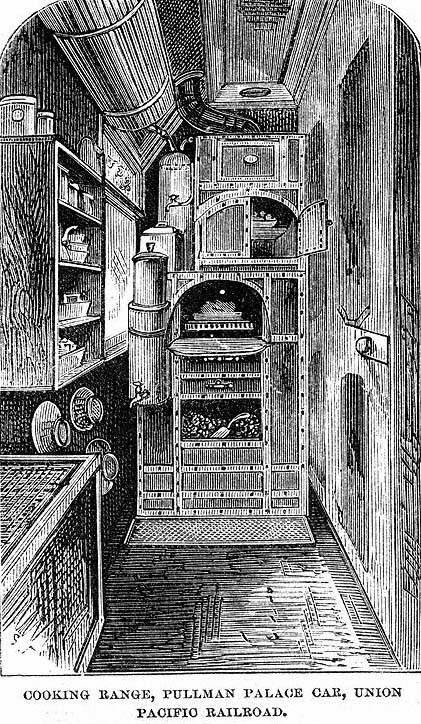 It can seat forty persons at the tables; it contains not only a kitchen — which is a marvel of compactness, having a sink, with hot and cold water faucets, and every "modern convenience" — but a wine closet, a china closet, a linen closet, and provision lockers so spacious as to contain supplies for thirty people all the way from Chicago to the Pacific if necessary; its commissary list contains, as I ascertained by actual count, 133 different articles of food; it carries 1000 napkins, 150 table-cloths, 300 hand-towels, and 30 or 40 roller-towels, besides sheets, pillowcases, etc., etc. And less you are of an investigating turn, you would never know that the car contained even a kitchen. Whenever a sleeping car arrives at the end of a journey, it is laid over for twenty-four hours. Thereupon the porter gathers up the soiled linen for the laundry, and a force of men and women enter the car and take out of it bedding, carpets, and every movable thing; all are beaten with rods and hung up to air; and meantime the whole car is aired, and the wood-work dusted, rubbed, and scrubbed in the most thorough manner. This is the manner of their housekeeping. On the whole, a company of three or four can travel the most enjoyably across the continent; and there is no reason why a man should not take his children, if they are ten years old or over, as well as his wife. Four fill a drawing-room comfortably, four can be comfortable in a section on a sleeping car; and in California, if you have three or four in your party, you can travel as cheaply by private carriage as by stage to all the notable sights of the State which you do not reach by rail, and thus add much to the comfort and pleasure of such journeys. On the cars you are sure to make pleasant acquaintance, and probably to your advantage, for you will find persons who have been over the route before ready to point out curious objects to you. And from the hour you leave Omaha you will find every thing new, curious, and wonderful; the plains, with their buffalo, antelope, and prairie-dogs; the mountains, which, as you approach Cheyenne, lift up their glorious snow-clad summits; the deep cañons and gorges which lead from Wasatch into Ogden, and whose grim scenery will seem to you, perhaps, to form a fit entrance to Salt Lake; the indescribable loveliness and beauty of the mountain range which shelters the Mormon capital; the extended, apparently sterile, but, as long-headed men begin to think, really fertile alkali and sagebrush plain; the snow-sheds which protect the Central Pacific as you ascend the Sierra; and on the morning of the last day of your Journey, the grand and exciting rush down the Sierra from Summit to Colfax, winding around Cape Horn and half a hundred more precipitous cliffs, down which you look out of the open "observation car" as you sweep down from a height of 7000 feet to a level of 2500 in a ride of two hours and a half. A grander or more exhilarating ride than that from Summit to Colfax on the Central Pacific Railroad you can not find in the world. The scenery is various, novel, and magnificent. You sit in an open car at the end of the train, and the roar of the wind, the rush and vehement impetus of the train, the whirl, around curves, past the edge of deep, chasms, among forests of magnificent trees, fill you with excitement, wonder, and delight. When we had seen the Wasatch cañons we thought the glory of the journey must be over, but the lovely mountains about Salt Lake gave us new delight; and last, as though nature and man had conspired to prepare a series of surprises for the traveler to California, comes the grand stormy rush down the Sierra, followed, as you draw down to the lower levels, by the novel sights of men actually engaged in gold mining; long flumes, in which they conduct the water for their operations, run for miles near the track; and as you pass below Gold Hill you may see men setting the water against great hills, which they wash away to get out the gold from the gravel which bears it. The entrance into California is to the tourist as wonderful and charming as though it were the gate to a veritable fairy-land. All its sights are peculiar and striking; as you pass down from Summit the very color of the soil seems different and richer than that you are accustomed to at home; the farm-houses, with their broad piazzas, speak of a summer climate; the flowers, brilliant at the roadside, are new to Eastern eyes; and at every turn in the road fresh surprises await you. On the plains and in the mountains the railroad will have seemed to you the, great fact. Man seems but an accessory; he appears to exist only that the road may be worked; and I never appreciated until I crossed the plains the grand character of the old Romans as road-builders, or the real importance of good roads. We, too, in this generation are road-builders. Neither the desert nor the sierra stops us; there is no such word as "impossible" to men like Huntington; they build railroads in the full faith that population and wealth will follow on their iron track. And they seem to be the best explorers. The "Great American Desert" which we school-boys a quarter of a century ago saw on the map of North America has disappeared at the snort of the iron horse; coal and iron are found to abound on the plains as soon as the railroad kings have need of them; the very desert becomes fruitful, and at Humboldt Wells, on the Central Pacific Railroad, in the midst of the sage-brush and alkali country, you will see corn, wheat, potatoes, and fruits of different kinds growing luxuriantly, with the help of culture and irrigation; proving that this vast tract, long supposed to be worthless, needs only skillful treatment to become valuable. One can not help but speculate upon what kind of men we Americans shall be when all these now desolate plains are filled, when cities shall be found where now only the lonely dépôt or the infrequent cabin stands; when the iron and coal of these regions shall have become the foundation of great manufacturing populations; and when, perhaps, the whole continent will be covered by our Stars and Stripes. No other nation has ever spread over so large a territory or so diversified a surface as ours. From the low sea-washed shores of the Atlantic your California journey carries you to boundless plains which lie nearly as high as the summit of Mount Washington. Americans are digging silver ore in Colorado three thousand feet higher than the highest point of the White Mountains. 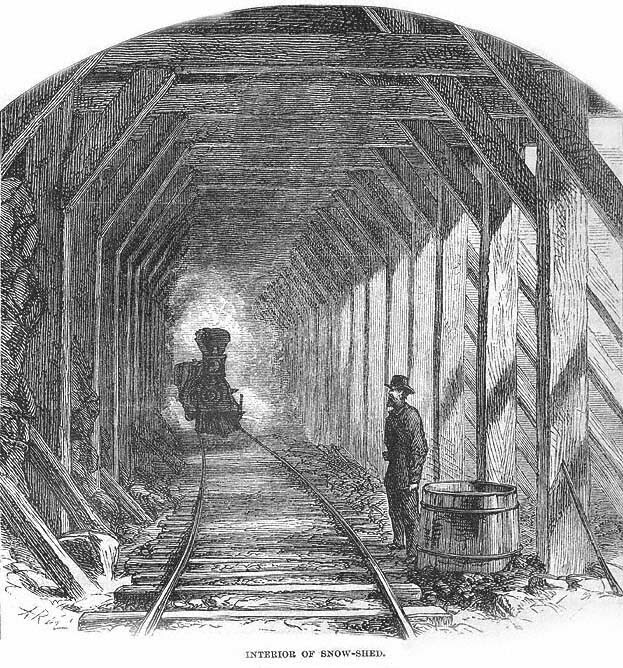 At Virginia City, in Nevada, one of the busiest centres of gold mining, the travelers find it hard to draw in breath enough for rapid motion, and many persons, when they first arrive there, suffer from bleeding at the nose by reason of the rarity of the air. Again, in Maine half the farmer's year is spent in accumulating supplies for the other and frozen half; all over the Northern States the preparation for winter is an important part of our lives; but in San Francisco the winter is the pleasantest part of the year. In Los Angeles they do not think it needful to build fire-places, and scarcely chimneys, in their houses. And one people, speaking the same language, reading the same books, holding a common religion, paying taxes to the same government, and proud of one common flag, pervades these various altitudes and climates, intervisits, intercommunicates, intermarries, and is, with the potent help of the railroad, fused constantly more closely together as a nation. What manner of man, think you, will be the American of 1972, the product of so many different climes, of so various a range as to altitude ? I wrote that on the plains and on the mountains the railroad is the one great fact. Whatever you notice by the way that is the handiwork of man appears to be there solely for your convenience or safety who are passing over the road. On the Union Pacific you see miles upon miles of snow-fences. 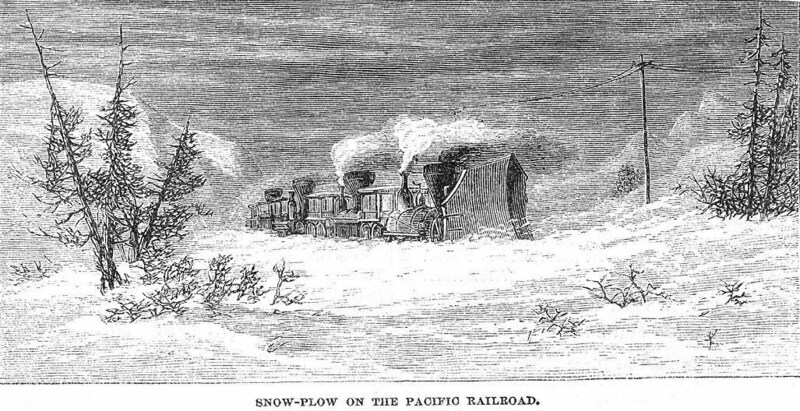 On the Central Pacific thirty or forty miles of solid snow - sheds, thoroughly built, and fully guarded by gangs of laborers, make the passage safe in the severest snow-storms. Great snow-plows, eleven feet high, stand at intervals on the plains and in the mountains, ready to drive, with three or four, or even seven or eight, locomotives behind them, the snow out of the cuts. The telegraph accompanies you on your whole long journey. Coal miles are opened only to furnish fuel to your locomotive. At intervals of a hundred miles, night and day, you hear men beating the wheels of the train to see if they are sound. Eating stations furnish you your meals; ice is supplied on the way; laborers stand aside in the desert and on the mountains as the train sweeps by, and close tip behind it to repair the track or keep it in order. There is a Chinaman and a half on every mile of the Central Pacific Railroad; and this road is not only a marvel of engineering skill and daring, running through a most difficult country, and abounding in deep rock cuts, tunnels, and snow-sheds, but you will find its road-bed every where firm and solid, as though it had been laid for years, the cuts clean and clear, and on every part of the work an air of finish and precision, which show the confidence of its owners, and the thorough spirit in which it was conceived and completed and is maintained. You reach San Francisco bypassing through the great Sacramento plain, one of the famous wheat fields of the State, to Vallejo, whence you sail down the magnificent bay of San Francisco to the city; and thus you have to the last hour of your journey some new scene opening to your eyes, and when you go to sleep in your hotel at last, may dream of the Cliff House ride as a pleasure still to come. I close this article with a few detailed directions to tourists, such as I should myself have been glad of when I first made the journey. 1. At Ogden your train will connect with the regular train for Salt Lake City, which place you reach the same evening. The Townsend House is kept by a Mormon, the American by a Gentile. An omnibus conveys you to either. Go to Brigham Young's theatre in the evening, if you like, and see his rocking-chair in the aisle, and the large space set apart in the box tier for his children. Rise early the next morning and walk about for an hour, and you may see almost the whole place. After breakfast get a carriage and tell the driver to take you to the Tabernacle and the menagerie — the last contains a number of native animals well worth seeing — and to show you the principal objects of interest. You will have time for a leisurely dinner before the cars start, and will yet have seen all that Salt Lake City affords to the traveler — for it is not easy for non-residents to see the inside of a Mormon house. 2. At Salt Lake City buy a little gold for California; they take greenbacks in Utah. 3. In San Francisco you can exchange your greenbacks for gold notes, which are more convenient than coin, and just as serviceable. 4. Eat only two meals per day on your journey, as you are not exercising nor working. After you enter California you will find both fruit and flowers for sale on the train — signs of civilization which do not attend you on an Eastern train. 5. From Ogden, when you start westward, telegraph to the Grand Hotel, the Occidental, or wherever you mean to stay in San Francisco, for rooms. The cost is a trifle, and it is a convenience to have your apartments ready for you when you arrive. 6. In planning your journey you will desire to know how much time is required, and what the expense of your trip will be. We give three schedules or time-tables for tours of various lengths, and a general estimate of expenses. FOR A FIVE WEEKS' TOUR. FOR A SIX WEEKS' TOUR. Santa Cruz, Watsonville, Pescadero, etc. FOR A NINE WEEKS' TOUR. Take the last, and add? If you can spare more time, you should add a week to your Yosemite journey, which would give you opportunity to make the tour of the valley's outer rim, which can be done by ladies now without discomfort. Fare by railroad from Chicago to San Francisco. Add, for hotel accommodations, $3.50 per day, which is the usual price; and for carriage hire in seeing the Almaden mines, $5; for horses and guides on the Yosemite, $5 per day; for meals on the railroad, $2 per day. 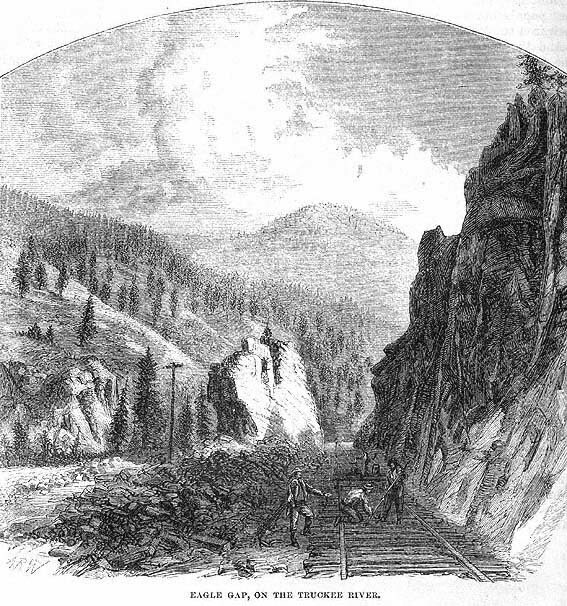 In all, $125 will pay your hotel and carriage bills, horse and guide in the Yosemite Valley, railroad, meals, etc. ; and this, added to $345, makes $470. This is a liberal and not close estimate; and if you allow $500 for five weeks' tour to California and back, you will have enough to pay the slight premium on gold, and to buy some curiosities to take home with you. And you will have stopped at first-class hotels every where, and used a carriage wherever it was convenient. To see Lake Tahoe, Donner Lake, and Virginia City will cost you twenty dollars more, including hotel bills. These you should see on your way home, getting off the Central Pacific train at Truckee, and resuming your place at Reno, when you have made the trip, without extra charge. Allow three days, and engage your sleeping-car accommodations at Sacramento, for a given day, on your way to Truckee. To Los Angeles you go by steamer; fare, $18 each way, which includes meals and state-rooms. The sail is a lovely one, with land in sight all the way. Try to secure a berth on the land side, as the coast affords continuously fine views. The steamer lands you at San Pedro. Thence by cars to Los Angeles the fare is $2 50. From Los Angeles you should drive to the Mission San Gabriel, where are the finest orange orchards. The drive will cost you from three to five dollars. At San Diego you see a fine bay and a growing city, which now waits for railroad connections. To Santa Cruz, Watsonville, and Pescadero the round trip should cost you from twenty to twenty-five dollars, and ten dollars less if you start from San José, after having seen the New Almaden quicksilver mines, and thus save the return to San Francisco. You will find good hotels every where, though often, in the country, plainly furnished. The bread is always good, food is always abundant, and generally well cooked, and the beds are always clean and almost always good. The stage-drivers, landlords, and others with whom a traveler has to do are civil and obliging, and there are no attempts at extortion. In a succeeding article ["California. II.—What to See There, and How to See It." Vol. 45, No. 265, pp. 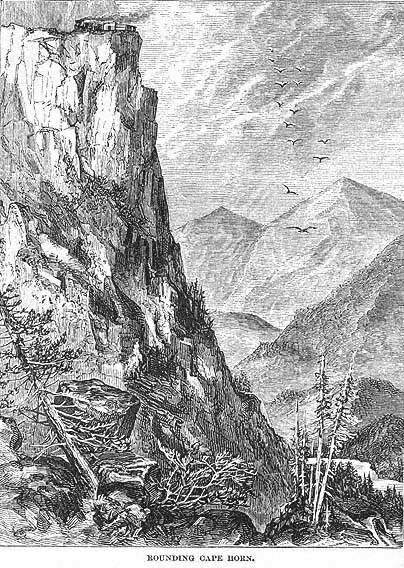 65-81, June, 1872] I shall attempt to give some more detailed account of the sights which are worthy of a tourist's attention in California. Note: Although not apparent from the titles, all three parts of this article pertain to the Central Pacific Railroad. California: for Health, Pleasure, and Residence. A Book for Travellers and Settlers. New York, Harper & Brothers, 1873.